GM22 leads four other streamliners through Cowan with M820. This train experienced delays further north, and would continue to be delayed before it could reach Sydney (see below). On a day in which many people filled The Gabba in Brisbane to watch Day 2 of The Ashes series, passengers and train crew on the Central Coast line (known as “The Short North” to railfans and railwaymen alike) were having a less than exciting day. Problems seemed to come thick and fast disrupting both NSW TrainLink passenger services and freight trains in both directions. Myself and a handful of other enthusiasts gathered at Cowan Station to bear witness to the proceedings. The troubles began at Wickham early in the morning when a motorist damaged level crossing equipment at Wickham (Newcastle). Train services were suspended in both directions between Broadmeadow and Newcastle and buses were called in to replace (and later to supplement) train services. 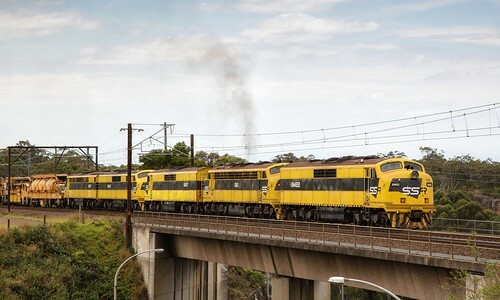 This then had a flow on delay to freight services heading south from Broadmeadow yard, as they were unable to leave on their paths – forced to wait in the yard for the late running passenger services to pass, to permit the slower freighters to follow. A typical day on the “Short North” sees a mix of interstate and regional container and steel trains moving both north and south, as well as bulk cement, sugar and coal traffic. The first of the trains delayed was 6NY3, a Pacific National SteelLink service. The “6” indicates a Friday departure from Newcastle (indicated by the “N”, this train starts at Morandoo Yard, Port Waratah). The destination of the train is indicated by the “Y” (Whyalla, SA). The fourth number is to distinguish between similar services operating on the same route. This train is timetabled to pass through Cowan at 0930 and into Cowan up refuge to wait for the following passenger service from Newcastle (due through Cowan at 0934) to overtake. As it was, the passenger train (Run 201C, operated by V28) arrived into Cowan 10 minutes down on the timetable at 0944. Following 201C up Cowan Bank was 6NY3, a mostly empty Pacific National steel train being hauled by four NR Class locomotives (NR37, NR5, NR119 and NR99). 6NY3 passed through Cowan at 0953 and proceeded into the up refuge to allow the following Newcastle service (N134, operated by V44 and V45) to overtake. 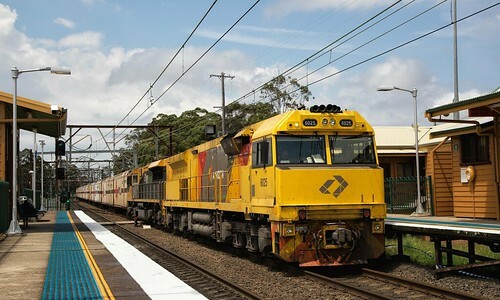 The next freight train to pass Cowan was 5112 – a Qube Logistics container freight from Narrabri to Port Botany. In this case “5” indicates the origin – North West NSW, the first “1” indicating the destination – Sydney. The second “1” indicates that the operator is Qube Logistics. As before, the fourth number is used to distinguish between different trains on the same route. 5112 is normally timetabled to pass through Cowan prior to the morning peak hour, although on this particular day it had been pathed later for whatever reason (this path change had occurred before the damage caused at Wickham). Passing through the platform at 1027, 5112 was hauled by GL109 “Just a Dash”, VL357 “Empire Rose”, 1103 and 1101 – the first two locomotives are lease units from CFCL Australia, whilst the latter two are owned by Qube Logistics. 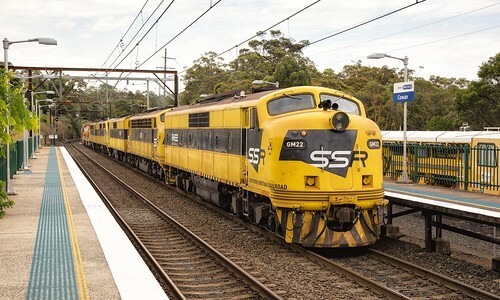 With 5112 safely locked away in the refuge, a succession of NSW TrainLink services passed through Cowan including a 4-car OSCar set running empty from Broadmeadow to Eveleigh following works at UGL Rail. The next freight train to pass through Cowan was 5MB4, a lengthy Pacific National superfreighter (1500m) from Melbourne to Brisbane. Since their introduction, the UGL Rail C44aci 93 Class locomotives have dominated this service, typically working in pairs (previously this service would have been worked by two to three NR Class locomotives) with inline fuelling. Unusually, today this service was worked through at 1055 by three 93 Class (9305, 9304 and 9308). Shortly after the passage of 5MB4, the nearby freeway was drowned out by screaming EMD engines in the form of LDP001 and LDP006 dragging their own superfreighter up Cowan Bank, running from Brisbane to Melbourne as 5BM7. These two “LDP Class” are owned by Locomotive Demand Power (a division of Downer Rail) and are leased to Aurizon for intermodal traffic. Included in the consist was the now standard rake of vans for SCT Logistics. Unusually, 5BM7 continued through Cowan on the mainline, rather than being put into the refuge like 6NY3 and 5112 had before it. This seemed unusual, especially as a skip-stopper from Newcastle was due to pass through at 1105. Information filtering through from further north revealed that lightning from a thunderstorm had knocked out a large number of signals in the Cardiff area, bringing trains in both directions to a stand. Traffic continued to flow north from Sydney however, with the other Aurizon superfreighter (5MB7) blasting through at 1123 behind 6025 and LDP008. Eventually, as the problems further north were rectified, the first southbound train through was a very delayed N138, running almost 50 minutes down on the timetable, with the following all-stations service from Newcastle arriving 30 minutes late. 6025 and LDP008 pass Cowan with 7MB7 Aurizon superfreighter. At midday, quad 82 Class locomotives announced their presence with ER74, a loaded coal train from the western coalfields to Eraring power station. Aside from the passage of the coal train, it was business as usual with various passenger trains arriving and departing as normal, until an announcement made across the P.A system that the 1234 train to Sydney would be departing from Platform Two. This service was overtaking a slow moving freight train on Cowan Bank. At 1240, M820 rounded the curve into the station (In this case, the “M” indicates that this is a maintenance train, with the “8” indicating that it has originated from north of Sydney). The combination of two works trains from the Ulan region, operated by Southern Shorthaul Railroad for ARTC using Sydney Trains (formerly RailCorp) equipment, the impressive consist was dragged up Cowan Bank behind no less than five streamliners, an all-star cast from around the country in the form of GM22, B61, GM27 (dead attached), GM10 and S317. They were hauling two ballast cleaners and a long rake of empty ballast hoppers (see below). GM22 and GM27 are 1800hp GM12 Class locomotives from 1962 and 1963 respectively. Originally owned by Commonwealth Railways, GM22 and GM27 were purchased by Great Northern from Australian Southern Railroad. Overhauled and repainted by Great Northern, the two locomotives passed to CFCL Australia in 2003. Following years in lease service to SSR and Patrick Portlink, the pair were sold to SSR in 2009. B61 is one of six surviving B Class locomotives originally purchased by the Victorian Railways in 1952. Rated for 1500hp, these locomotives were retired from government service and sold to private operator West Coast Railway in the 1990’s. B61 passed to CFCL Australia with the collapse of West Coast Railway in 2004 who overhauled it. 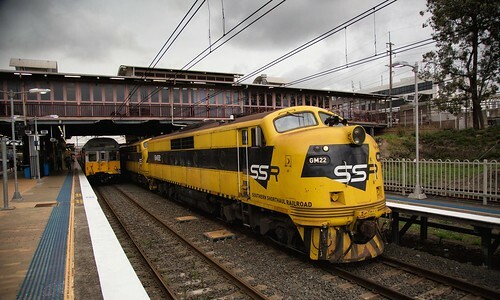 Painted in the SSR livery, B61 was leased it to Southern Shorthaul Railroad for infrastructure trains in Victoria and NSW until it was eventually sold to SSR. GM10 is the oldest commercially operated locomotive in Australia, dating back to 1952. Rated for 1500hp, this A1A-A1A streamliner represents the first use of the EMD Streamliner design in Australia. Like GM22 and GM27, GM10 is a stalwart of Commonwealth Railways, having passed to Great Northern, CFCL Australia and now SSR. Built in 1961, S317 was the most modern locomotive of the five, which is saying a lot when it is still over 50 years old! Rated at 1,800hp, the S Class were delivered to the Victorian Railways from 1957 in two batches. S317 was originally inherited from the remains of Great Northern, following purchase of the business from CFCL Australia. Following the locomotives was BJ006 – a ballast cleaner purchased by the Rail Infrastructure Corporation (RIC) in 2002 from Plasser Australia (model RM900-HD). This self-propelled unit weighs 506 tonnes and is made up of six articulated sections. One of these sections (located at the rear of the machine) is a wagon with three 15,000l water tanks used in dust suppression at worksites to reduce environmental impact. This unit works in conjunction with the NHMF material handling wagons (see below). When self-propelled, the unit is powered by two V12 Caterpiller 3412 engines, each outputting 710kW. A continuous conveyor belt runs across the top of all sections, allowing the transfer of material to/from any attached NHMF material handling wagons. A photo showing BJ006 at Warabrook in April 2013. Click on the photo to see a larger resolution. Following BJ006 were six NHMF material handling wagons (MFS40 wagons, also built by Plasser Australia) – these are connected to BJ006 during operation. These wagons are used to distribute ballast and spoil to enable continuous operation of BJ006, and are also connected to the water supply used by BJ006 for dust suppression. Trailing the NHMF wagons was a single NFGF match wagon – this is due to the conveyors for each NHMF protruding out approx. 4.3 metres behind the main body of the wagon (to transfer ballast/spoil from one NHMF wagon to the next). As well as removing the overhang, the match wagon supports the last conveyor. The next part of the consist was BJ003 (preceeded by its own NFNF match wagon ). BJ003 is a much smaller ballast cleaner than BJ006, being a Plasser RM74 BR-UHR unit, a single vehicle (not including the match wagon or associated NHMF wagons). Two NHMF material handling wagons were attached to the rear of BJ003, as well as a NFPF match wagon (performing the same function as the NFGF, above). At the rear of the train was an empty ballast rake, comprising of 22 empty NDFF ballast hoppers with a NZBF ballast plough at either end. 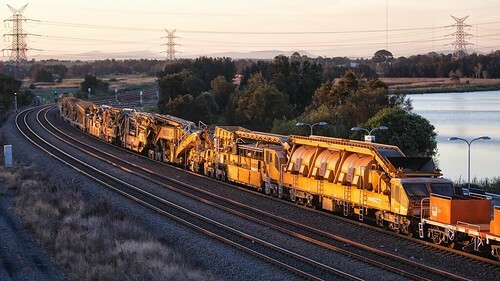 The NZBF plough wagons are used to smooth the unloaded ballast, prior to other track machines being used to tamp the ballast down under the tracks. The total trailing load behind the locos was a little over 1500t, for a total length of just over 750m. A crew change would be performed at the Sydney-end of Cowan Refuge, which was done on the mainline – as a passenger train had already overtaken, there was no need for the train to go into the refuge. Departure following the crew change was a very noisy spectacle at 1245, with B61 especially keen to show that it was contributing with a tall plume of smoke coming from the exhaust. M820 departing Cowan following a crew change. Shortly after departure from Cowan, the departing crew noted that part of the equipment on BJ006 was contacting the overhead wiring. Whilst it had not tangled in the wiring or damaged the overhead, the arcing was still a serious problem requiring both M820 and other traffic in the area to be stopped to permit the errant part to be secured. Sydney Rail Services train number 4174 (Sandgate to Port Botany container freight) was following M820 up Cowan Bank, and it was sent into the refuge to wait for the problem to be corrected. Qube Logistics container freight 4112 from Carrington was propelled into Hawkesbury River up refuge (the refuge itself is very short, so freight trains often need to propel back in to the yard). As a result, both of these trains would miss the afternoon “freight curfew” within the metropolitan area, and remained in their respective loops until the afternoon peak had ended. The problem with BJ006 was identified and corrected a little under two hours later, and M820 resumed its journey once again, passing through Hornsby at 1501. It was shortly followed by a late running 5BM4 Pacific National superfreighter at an unknown time. It is very unusual to see a freight train passing through the metropolitan area after 1400, however the length of the train combined with its location at the time of the problem ensured that it would need to keep going to prevent blockage of the mainline. The Northern Sydney Freight Corridor project (with passing loops being constructed at Gosford, a third track from Epping to Thornleigh, and a new flyover at North Strathfield) will hopefully minimise problems associated with freight trains forced to run into Sydney before or after peak hours. M820 finally makes it to Hornsby Station following a succession of mishaps on The Short North. Recently move into Mt Kuring-Gai looking across at the trains. Brings back memories as a youngster at Belmore North Public school in the late 40s early 50s. The school backed on to the freight line from Chullora to Campsie and we use to run down and record the train number as the od puffers passed by. Today I sit and listen to the screeching brakes and ear shattering noise of the diesels. Yes I moved into their territory but there are certainly some diesels that are more identifiable than others and to my mind must exceed the legal noise level.